SeinfeldVision In this classic episode, Jack decides to repurpose old NBC footage from “Seinfeld” and edit them into programs on air. 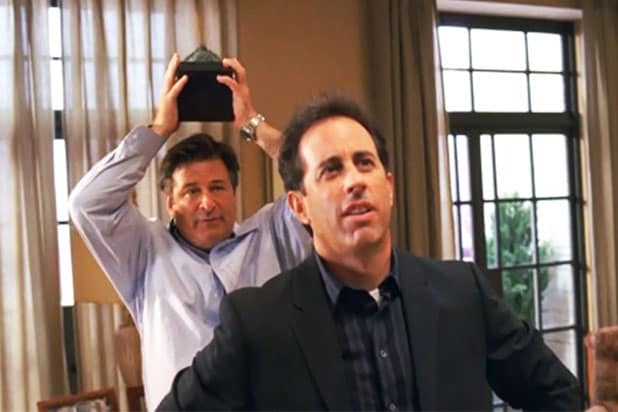 Jeremy Seinfeld comes back from his vacation to confront Jack and tells him he just come back from Grenyarnia, a “country only known by the richest people on earth.” The episode also features one of Jack’s best one-liners. Liz comes back from summer hiatus to tell Jack that this will be her year and that she’ll meet someone else after breaking up with Floyd. “Woman your age are more likely to be mauled at the zoo than get married,” Jack responds. Everything Sunny all the Time Always In the episode, Jack discovers that his wife, Avery Jessup (Elizabeth Banks) has been detained by Kim Jong-il (Margaret Cho) in North Korea. She is used for propaganda purposes on the North Korean news station, of which Johnny Mountain, Kim Jong-il’s alter ego, is the weatherman. He delivers one of the best lines of the episode: “Everything sunny all the time always good time beach party.” At the same time, Liz tries to control her personal life when she notices a plastic bag stuck in the tree outside her apartment window. She attempts to take matters into her own hands and of course, it fails. Sandwich Day “Ooh! Sandwich day.” We all know sandwiches are the Holy Grail for Liz. So when she doesn’t get hers, she’ll, you know, casually flip over a table or threaten Kenneth that she’ll cut him a chin. At the end of the episode, Liz tries to catch Floyd at the airport before he takes a flight to Cleveland. Having finally got her sandwich, she tries to get it through security but can’t bring it with her because of the dipping sauce. “Just leave the sandwich and go through,” the TSA agent tells her. “Leave the sandwich?” Liz responds in disbelief – which only prompts her to shove the entire sandwich down her throat and run to find Floyd. Last Lunch This was the series finale, so obviously, we had to include it on this list. Liz is gearing up for the final episode of “TGS” but she has to deal with all sorts of problems: Jack has quit his job, and it’s Lutz’s turn to choose lunch for the day, and he decides to get everyone back for the years that they have been picking on him. The Epilogue also finally supports every true fan’s theory: that Kenneth, now the network president, is immortal. Dealbreakers Liz launches her new talkshow, “Dealbreakers,” but Jack’s arch nemesis, Devon Banks, puts pressure on the situation, therefore making Jack interfere with Liz’s appearance. After 510 takes, they finally settle on an opening title for the show. Liz channels her inner Jenna Maroney and locks herself in her dressing room. And while Liz is busy with her own show, Frank becomes head writer of “TGS” and starts acting, and dressing, like Liz. Also, Jenna locks herself into her dressing room at the beginning of the episode in one of her usual tantrums: This time, her niece drew a picture of her that didn't sit well with her. Ludachristmas Liz’s family comes to visit for the holidays and Jack’s mom, Colleen, also comes to New York. Liz’s family seems perfect but Colleen sets out to prove that they are just as screwed up as her and Jack are. Meanwhile, the cast get ready for the annual Ludachristmas party, but Kenneth is annoyed that the cast and crew of “TGS” forgot the true meaning of Christmas. This inspires everyone to go outside the 30 Rock building to tear down the big Christmas tree. The Bubble Liz starts dating Drew, played by Jon Hamm, who she discovers lives in a “bubble” because of his good looks. She finds out he can’t play tennis although he was a tennis coach, and can’t perform the Heimlich maneuver although he is a doctor. Queen of Jordan Tracy Jordan's wife Angie fulfills her promise of becoming a Bravo superstar in this episode, presented entirely as an installment of her reality series "Queen of Jordan." It's a fresh and hilarious lens in which to view the characters, and introduce new ones like a then-undiscovered Tituss Burgess (who plays hairdresser D'fwan, and would go on to star in another Tina Fey-Robert Carlock series "The Unbreakable Kimmy Schmidt). This episode also gave birth to a beautiful gif of Angie (Sherri Sherphard) saying the word "ham." The Rural Juror It doesn't get more "30 Rock" than this: Narcissistic Jenna can never get approval from judgmental Liz on creative efforts outside of their show "TGS," as exemplified by an indie crime film she makes based on a novel by John Grisham's fictional brother Kevin. The best gag of the episode, and perhaps the series, is when no one can figure out her movie title when Jenna pronounces "The Rural Juror" swiftly as one word. Black Tie On top of being one of the weirdest (and incredibly enjoyable) episodes of the series, "Black Tie" was an early indication of how broad and zany "30 Rock" would become. Paul Reubens' cameo as an inbred foreign prince, and Isabella Rossellini's as an abusive ex-wife to Jack Donaghy, get epic laughs. It also sets the table for the Liz-Jack friendship, two souls suffering from crippling codependency. Jackie Jormp Jomp Jenna will never give up her dream of winning an Oscar, even though the Janis Joplin estate will not sign away her life rights for the biopic being filmed in this episode (the title is a reference to what NBCUniversal must call the character, as they don’t even have permission to use Janis’ name). Meanwhile, Liz Lemon finds herself suspended from the office, and joins a cult of stay-at-home women who indulge in luxury and leisure. The group has a sinister (and hilarious) admission price that leaves Liz worse for the wear. My Whole Life is Thunder Late legend Elaine Stritch guest starred several times as Alec Baldwin's mother, Colleen Donaghy. 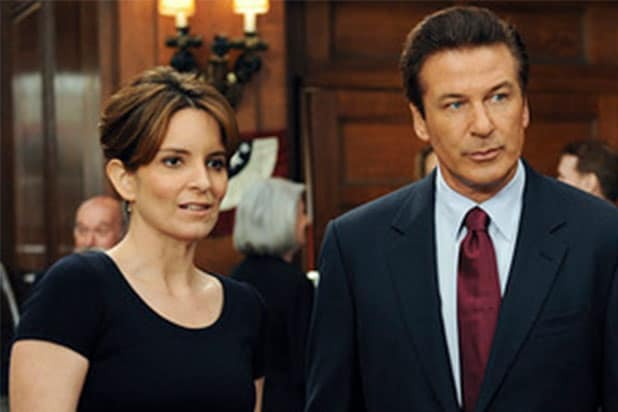 The salty, never-can-be-pleased old broad was perfection, but even in "30 Rock" all good things come to an end. This episode dealt with Colleen's passing, one of a few earned moments of sentimentality. Baldwin shines giving a eulogy that brings down St. Patrick's Cathedral, with assists from Paul McCartney and Kermit the Frog. Verna Late "SNL" player Jan Hooks guest-starred as Verna Maroney, the glorious white trash mother of Jenna. While we always knew Jenna was a self-made, malignant narcissist, we could not have anticipated the depth of dysfunction brought by Verna. Out for cash and heavy on the guilt, Verna wreaks havoc on the "TGS" set. Look out for an unforgettable duet of Captain & Tennille's "Do That To Me One More Time." Tracy Does Conan This season one gem gives us back story on Tracy Jordan's eviscerated Hollywood reputation -- and introduces us to one of the show's greatest gifts, the crooked Dr. Leo Spaceman (pronounced Spa-chem-an, played by Chris Parnell). Anna Howard Shaw Day In her refusal to celebrate Valentine's Day, Liz Lemon elevates famed suffragette Shaw -- and also seeks anyone to help her home from dental surgery. Lemon has a laughing gas trip to end them all, which reunites her with past love interests in Jon Hamm, Jason Sudeikis and Dean Winters.